Sambar vadai is one my all time favorite, in fact i can say it is the entire family's favorite one. I have very fond memories associated with this vadai. 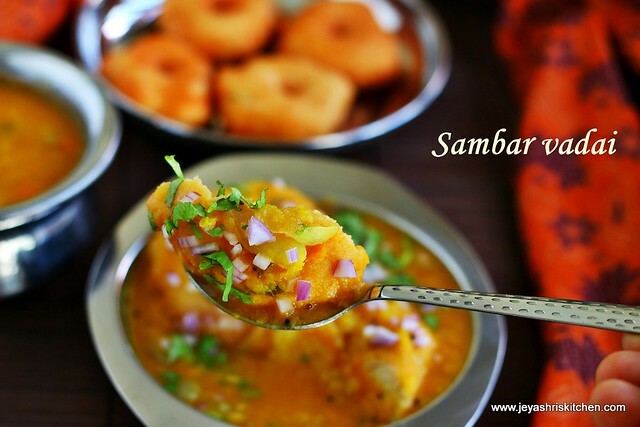 I have been postponing to post this sambar vadai post here for such a long time. During my childhood days, my dad used to take us to hotels and those days, eating out is a rare thing in many houses. But in our house, appa takes us out almost every weekend. And those days we get only South Indian food varieties at hotels. 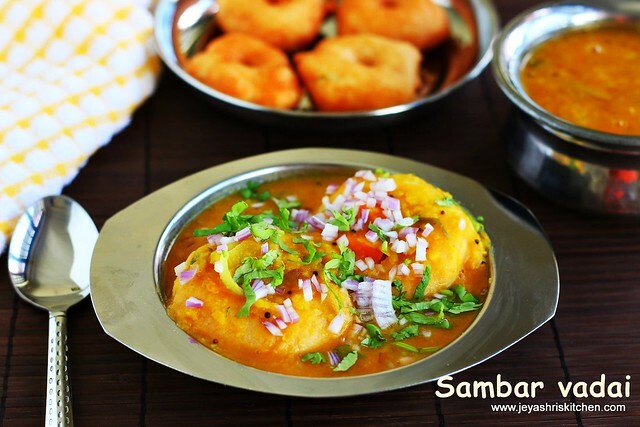 Sambar vadai is one among our favorite and also rava dosa too. Appa loves sambar vadai and he always says that it should be soft and and slip into the throat while eating it. Many restaurants when we order samabr vadai, they will just put medu vadai in hot sambar and immediately serve. Though it taste good, it will not be so soft and it will be difficult to cut with the spoon. I vividly remember when i was studying in 9th grade, we went to Trichy for a wedding. That time appa took us to a market place and there we had an evening tiffin as we all felt hungry. I still couldn't forget the taste of sambar vada which we had there. It was a very small eating outlet and the sambar vada was out of the world. After that, whenever we eat sambar vadai outside, we both recall the sambar vadai which we had in Trichy. So somehow when i see or hear or eat it will bring back all the memories of my childhood associated with my dad. Today i finally managed to write this post and i missed my dad very much while eating the delicious sambar vadai. It has been 21 years since now, he left us, but the memories are still greenish and will always be cherished. First soak the urad dal for vada and let it soak for an hour. Let's start making the sambar. Peel the skin of the onion and garlic . Chop the tomatoes finely. Put the toor dal, onions, garlic and chopped tomato in a bowl and add sufficient water to this. Add turmeric powder and pressure cook the dal for 5-6 whistles. Mash the cooked dal nicely using a ladle or a whisk. Take a thin extract of the tamarind by adding 1 and 1/2 cups of water to this. Chop the carrot and capsicum into small. In a pan add the carrots, capsicum, tamarind extract, sambar powder, and salt. Once the raw smell of the sambar powder goes, add the cooked toor dal to this. Add water to bring it a sambar consistency. Add jeera powder to this. Boil this for 5 minutes. Switch off the flame. Add the ghee to this. In a pan add oil and mustard seeds. Break the red chili into two. Add the asafoetida. Once the mustard seeds splutter, switch off the flame. Sambar is ready. Mix well and add finely chopped curry leaves. Cover it and keep aside. Let's start making the vada. Please refer my Vada recipe for detailed step and recipe. Skip adding onions to the vada. Shape the vada and carefully drop it into the oil. Deep fry till brown . Boil the water and pour the water in a wide bowl. Soak the vada in hot water for 20 minutes. Add 2 pinches of salt to the water. As the water absorbs the salt in the vada, soaking in salt water will not make the vadas bland while eating. After 20 minutes, take out the vadas from water. Gently squeeze the extra water. Place the vada in the serving bowl and pour hot sambar on the vadas. If the sambar is warm, reheat it and make it hot. Meanwhile chop the onions and coriander leaves finely. Garnish with finely chopped onions and coriander leaves. Add more sambar, if needed while eating the vadas. The vadas will double in size when you soak in water. So while making the vadas ensure it is not too big. Soak the vadas in hot water and not in warm water. Soaking in hot water, makes it airy and light, and absorbs the sambar more and keeps the vada soft and spongy. Cooking the onions with toor dal enhances the taste of the sambar and also while eating the vadas it will not come into the mouth. Ensure to pour the piping hot sambar to the vada while serving. Awwwww.....such a lovely nostalgic post about my favorite mama and his favorite Sambar Vada Jey! IF there is one dish that can be called special for all our family members, it must be this one. Thanks for sharing the recipe. Kalakkal post, J! Andha naal gnabagangal. Sambar vadai...kula snack, very apt. Thanks for the recipe :). Hi! This recipe is one of my favorites and I love the the pictures. I am going to try this recipe soon. But, I am a little confused with regards to the 1 pod garlic mentioned (means it will be around 5-6 cloves of garlic. I use the big garlic pods). Please correct me if I am wrong. I want to get the sambar right when I will make it. It is just one pod, not one whole bulb of garlic. It is optional. Try it and let me know how it turned out.